Rahul Gandhi said that the party has “decided that 6 per cent of GDP will be given to India’s education”. The manifesto says that this will be done by 2023- 24. Focusing on the “main themes” of minimum income guarantee (Nyay), unemployment, farmer distress, education and health while addressing issues of internal and national security to counter what now form the centrepiece of the BJP poll campaign, Congress president Rahul Gandhi and his party Tuesday rolled out an election manifesto with a welfare vision for the country if voted to power in the Lok Sabha elections. 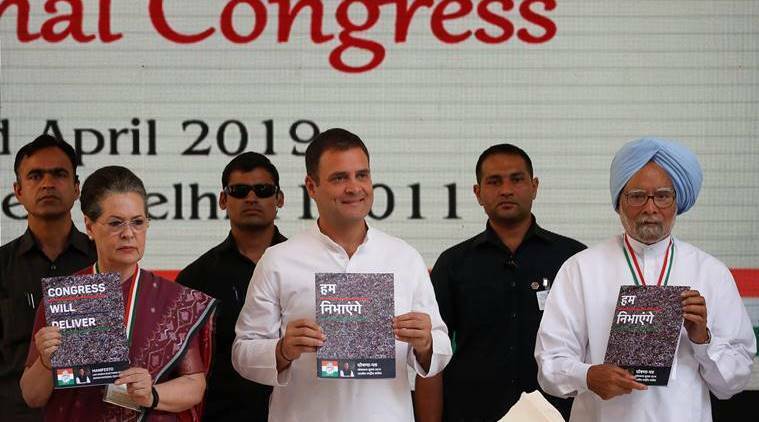 The manifesto — its English version is titled “Congress will deliver” while the one in Hindi is called “Hum Nibhayenge” — includes ideas to prevent loan-defaulting farmers from going to jail, a new Right to Healthcare for all, higher national expenditure on education, a national minimum income support scheme, a new Ministry of Industry, Services and Employment, a promise to fill government vacancies within a deadline, and higher number of workdays guaranteed under MNREGA. “Our symbol is the hand,” Gandhi said, outlining the party vision, and “there are five main themes in the manifesto… main mudda desh mein rozgaar ka hai, aur kisano ki samasyaon ka hai” (the main issues today are of unemployment and problems of the farmers)”. According to him, the economy is stuck, and that’s why changes to GST and Nyay scheme are important. The manifesto promised two radical changes in laws pertaining to agriculture. The party said it would repeal the Agricultural Produce Market Committees Act and “make trade in agricultural produce, including exports and inter-state trade, free from all restrictions”. It also called the Essential Commodities Act, 1955 a law that “belongs to the age of controls” which it would “replace” by an “enabling law that can be invoked only in case of emergencies”. Gandhi chose to project a more inclusive and welfarist image of his party. “In the last five years,” he said, “the BJP has worked towards dividing the nation, spreading hate in the nation”. His party, he said, “will work towards bringing the country together”. “It is a very inclusive manifesto,” Gandhi said, and took a swipe at Prime Minister Narendra Modi’s popular radio programme, saying “it is a manifesto that has come to us from the people… manifesto mein aapke mann ki baat hai, humare mann ki baat nahi hai”. The manifesto is divided under six sections — kaam (work), daam (cost), shaan (pride), sushasan (good governance), swabhimaan (self-esteem) and samman (respect). Speaking ahead of Gandhi, senior Congress leader P Chidambaram, who headed the team that prepared the manifesto, said the idea is to “create wealth and guarantee welfare”. Focusing on five ideas, Gandhi spoke on the minimum income support scheme (Nyay).”Prime Minister said that he will put Rs 15 lakh in each bank account. That was a lie. The entire country knows it was a lie. We picked up what he said. We asked how much can the Indian government really put in the bank accounts of the poor.” He said the party came up with a number of Rs 72,000 a year for the poorest and coined the slogan “gareebi par vaar, bahattar hazaar”. Without going into details, he said the scheme will be a joint one between the central government and the states and will be rolled out in phases — design, pilot and testing phases. Also, an independent panel will be formed with economists, social scientists and statisticians who will oversee the rollout and the “programme will move from one stage to the other only after a ‘go ahead’ from the panel,” the manifesto stated. This is the “first guarantee of the Congress party”, he said, that over five years, the poorest will get Rs 360,000. “It will give money directly to the farmers and the poor,” he said, and “jumpstart” the economy which has been “devastated” through demonetisation and GST. Calling employment and farmers the “two biggest issues”, Gandhi laid down his party’s plans for both segments. He said 22 lakh government jobs are lying vacant. His party, he promised, “will fill them by March 2020”, adding that “10 lakh youth can be given jobs in gram panchayats”. The manifesto, however, mentioned that just 4 lakh vacant jobs are under the central government, central public sector enterprises, judiciary and Parliament. For the rest, the manifesto stated, that as a condition for “devolution of funds to the healthcare and education sectors and to Panchayats and Municipalities, Congress will request State Governments to fill all vacancies, estimated at 20 lakh, in the 2 sectors and in local bodies”. He also spoke on the party’s other “innovative” idea to create jobs: “For three years, India’s youth do not need any permission from anyone to open a business”. He said as the youth open businesses, they will create jobs and his party’s government will help them. The manifesto promised 33 per cent reservation for women in all government jobs. The reservation will be horizontal, which means that in all categories whether reserved for Scheduled Castes/Scheduled Tribes or Other Backward Classes, or in the general category, one-third of the jobs will go to women. To address agrarian distress, he defined a multi-pronged approach. “There must be a separate farmer budget, like the railway budget” so that the farmers have better knowledge. “Everything should be in front of him, in a transparent manner,” he said. The second “historical step”, he said, would be that farmers unable to repay loans will not be treated as criminal offenders. “If a farmer is unable to repay, then it is a civil offence rather than a criminal offence,” he said. He also promised that a Congress government will expand the scope of the MNREGA with a guaranteed 150 days from the present 100 days. On education, the Congress president said that the party has “decided that 6 per cent of GDP will be given to India’s education”. The manifesto says that this will be done by 2023- 24. He said Congress government wants to make “top quality institutions accessible to everyone everywhere”. Similarly, in health, Gandhi said that “our focus will be that the poorest person has access to high quality hospital, high quality care”. A Congress government will not take the route of private insurance, he said, criticising the Ayushman Bharat Yojana because its “aim is to take money from India’s people and give it to 10 to 15 industrialists as insurance”. The Congress, he said, will “strengthen government hospitals and government healthcare”. The manifesto mentioned a new Right to Healthcare Act that will “guarantee to every citizen the right to healthcare services, including free diagnostics, out-patient care, medicines and hospitalisation through a network of public hospitals and enlisted private hospitals”. The Congress promised to “double” the government’s spending on healthcare to three per cent in five years.